Canadian Geese swimming in a pond and waddling along the shoreline are incredibly cute, especially when there have adorable, fuzzy, little goslings in tow. But unfortunately they also cause damage to stormwater management facilities where they reside. We frequently come across geese families during our inspections and have noted many of their effects. 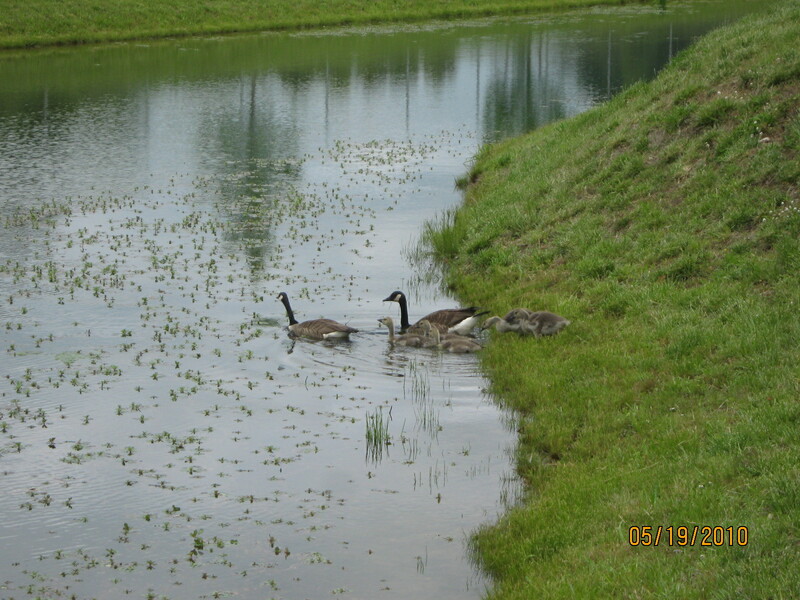 Goose family going for a swim in a stormwater management facility. The first problem results from the geese grazing on vegetation. They graze on the short grass along the shoreline, often to the point where it looks like a fuzzy fake green deck carpet from the 1970’s. This vegetation eventually dies and leaves the shoreline susceptible to any wave action and storm runoff. Secondly, during their grazing activities, the geese walk up and down the embankments removing and trampling vegetation further adding to the shoreline erosion. Third, the geese tend to deposit feces which accumulate around the facility. Goose feces damage property, compromise overall quality of life, introduce bacteria into the receiving waters, and have the potential to pose serious health threats due to the presence of disease-causing organisms. In short, they can turn a stormwater management pond into a point-source for pollutants. AND, they can turn a nice walk around the pond into a shoe cleaning session! Pollution issues aside, costs for damaged vegetation and shoreline erosion can easily run into the tens of thousands of dollars. Quite a price to pay for giving birds a happy home. Angry goose protecting her nest encountered during an inspection. 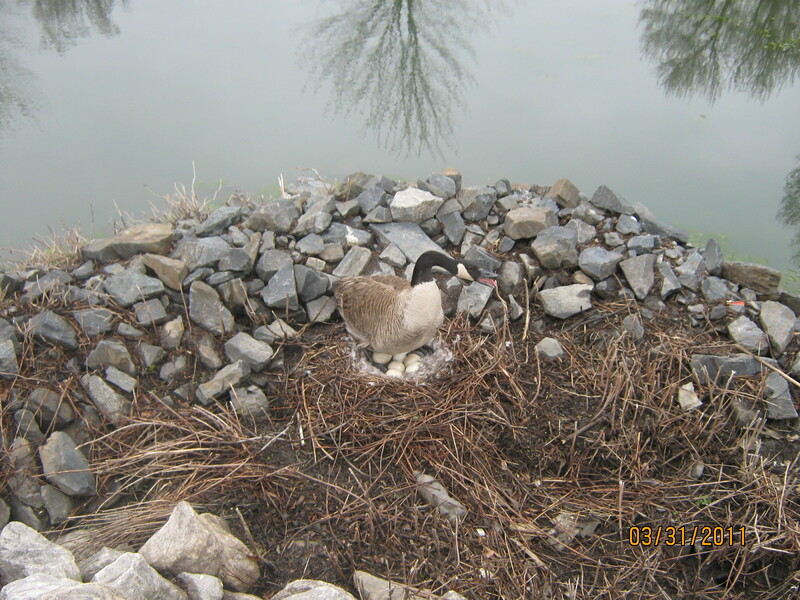 Fortunately, there are some methods to discouraging geese from nesting in your pond. The first step is to discourage tenants and guests from feeding the geese. If people continue to feed geese they will often remain despite other more expensive and time consuming efforts and frequently suffer from poor health due to nutritional deficiencies. A second easy step is to direct your landscapers to stop maintaining the bottom foot or two of vegetation around the facility and encouraging woody vegetation to grow, which reduces the value of the habitat. Geese are grazers, and prefer to feed on short grass in areas that are open and within sight of a body of water. This will also prevent the geese from walking up and down the embankments resulting in damage to the embankment. This practice must be closely monitored on fill embankments to avoid the growth of extensive woody vegetation. Other more expensive alternatives are available if the first two steps do not do the trick. Some examples include using flagging attached to wooden stakes or helium filled balloons with decals resembling eyes to deter geese from sticking around. Also harassment of the geese with pyrotechnics, propane cannons, trained dogs, horns, distress calls and other devices can be effective in deterring geese. Feel free to leave comments with other suggestions. Do riparian buffers planted with shrubs and grasses need goose fencing along the water’s edge to keep geese from exiting the water through the buffer? It likely depends on the spacing of the vegetation. If it is tight enough and well-established enough to form a barrier, it should work.